Native to New South Wales, South Australia, Tasmania and Victoria. 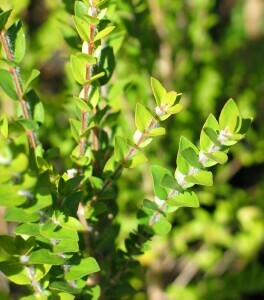 Shrub or small tree to 12 m high with papery bark. 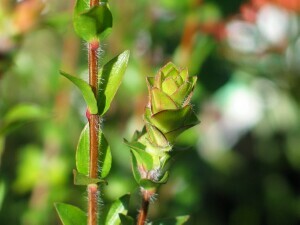 Leaves opposite and ovate to broad-ovate, 5–15 mm long, 4–7 mm wide with an acute to sharply pointed apex and 5–7 longitudinal veins. Flowers more or less terminal, in dense spikes 1.5–4 cm long, white to yellowish but sometimes tinged with pink. Fruit cup-shaped, about 4 mm wide. Common on peaty ground in wet scrub and heath-land and on waterlogged soils in southern Victoria. Not commonly found on saline soils but studies have shown the species to be highly tolerant to salt. A key to the more common Melaleuca species on waterlogged and saline land can be accessed here – Key to Melaleuca.